Hello! Thanks for dropping in for a visit. We're already enjoying our front porch, but it's not done.. yet. Today Richard is doing the painting of red and white. Tomorrow he will put the finish on the wood deck. We've decided on the lightest color transparent stain so the wood will show through. I'll show you how that looks when it's done. 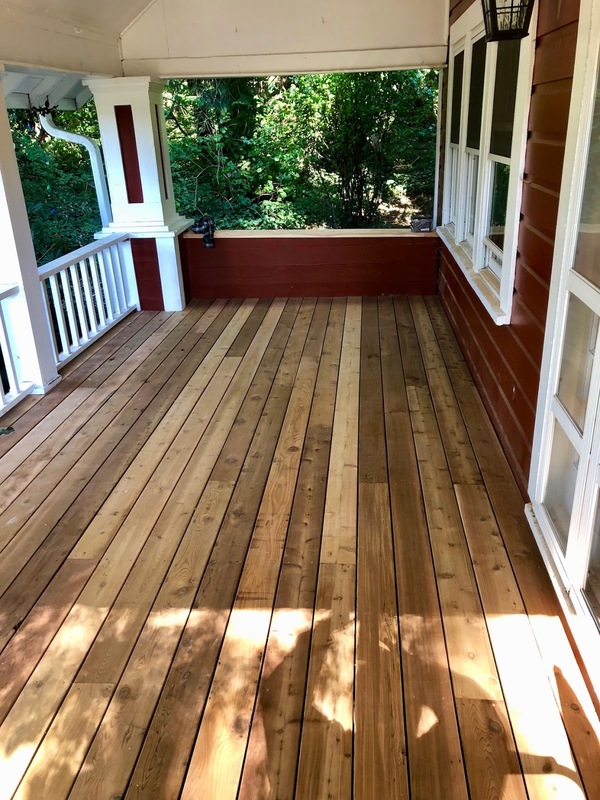 Our latest decision to make is - do we want to put a porch swing back on the porch, OR.. some Adirondack chairs.. OR.. some white painted rocking chairs? What do YOU think? 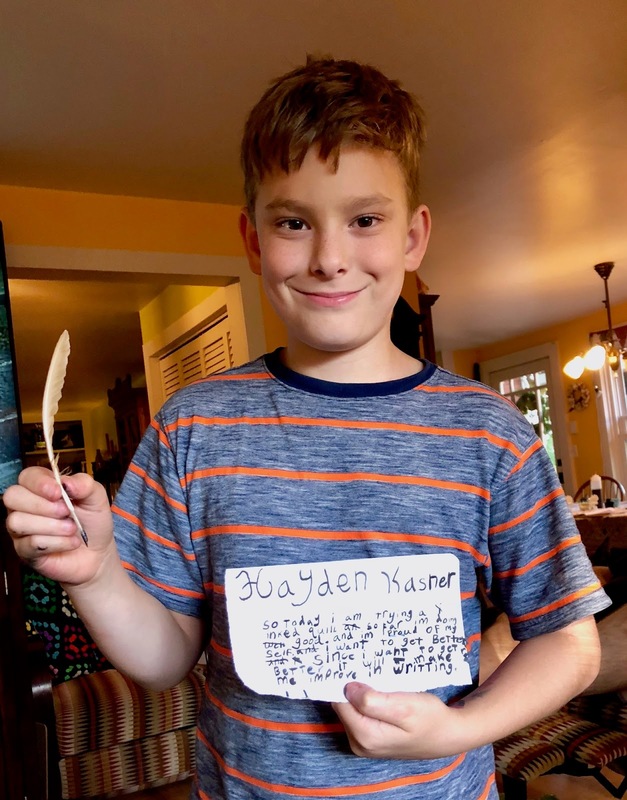 Yesterday my grandson Hayden found a couple of feathers, I think it was from our chickens. He came to me and asked me if he could make a quill pen from it. I said sure, and his dad carved the tip for him and scraped out the pulp in the tip so ink would fill in the tip. 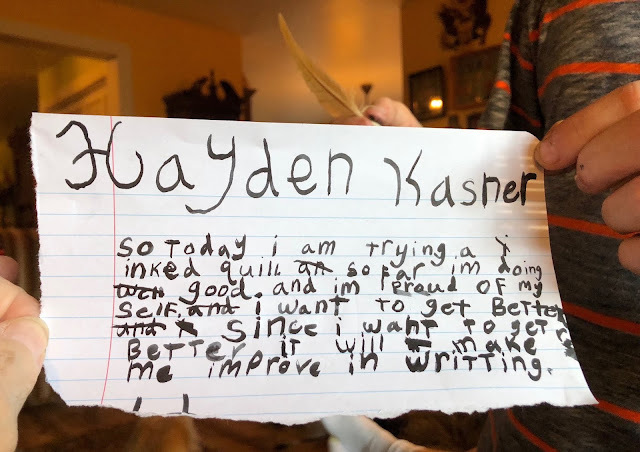 Then I told him where I kept my ink, in my secretary in the living room, and had him bring a notebook and I demonstrated how far to dip the quill into the ink and how to use it for writing. Then he sat at the table and proceeded to write with it. I was so impressed!! What a neat kid!! Awww.. I love this kid. I have decided that I will let him use one of my fountain pens and sit with him at the table and show him how to write cursive. How cool to make your own quill pen - that's wonderful. Your grandchildren are having such a wonderful upbringing. I vote for some rocking chairs and Adirondack chairs! Way to go, Hayden!!! He did a really good job. As for the chairs .... I love the look of Adirondack chairs but they can be a bit hard to get OUT of sometimes. Rockers are always pretty relaxing. Your porch looks nice and cozy. Whatever you feel like to sit on would be fine. As long as it's comfy! Hayden is quite the grandson and trying out the quill pen is an adventure in writing!